- You’ll trigger this quest while looking around Diamond City. Several of the NPCs here are quite liberal about things they’ve heard about, and one of them will, probably after a few minutes of exploration, tell you about the Freedom Trail. 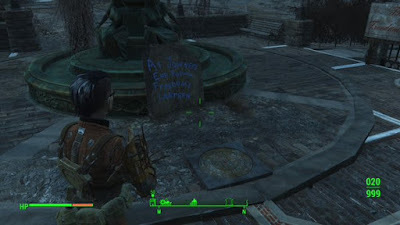 This will trigger the quest and point you towards your first destination, Boston Common. 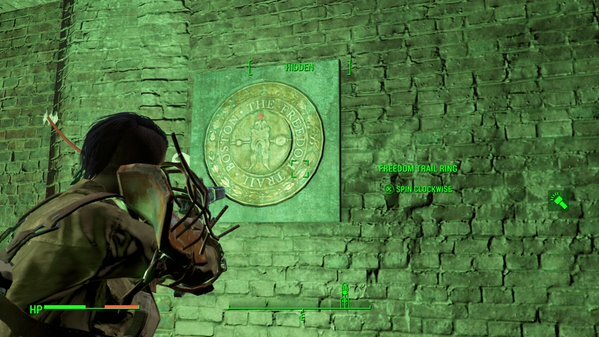 - Boston Common is located to the northeast of Diamond City. It’s not a long walk, but you have to wander through some hairy territory to get there, most of it belonging to Super Mutants (and if you get really unlucky, the occasional Mr. Gutsy unit). If you want to avoid danger, stick to back alleys and move quietly. Trinity Square is particularly dangerous, given the presence of Super Mutants in Trinity Tower. - Upon arrival in Boston Common - which is, itself, pretty quiet, and only hazardous thanks to the presence of radioactive barrels in a gazebo - check the small park’s east side. There’s a fountain here, covered in sculpture of elegant women, with a sign out front about the Freedom Trail. Check the marker on the ground in front of the sign. It proves the hints ‘7’ and ‘A’. A Super Mutant base outside Faneuil Hall. Be careful while wandering along the Trail. Boston is as perilous as usual, and a few of the landmarks are dangerous. The Burying Ground is inhabited by Ghouls, the stretch between Burying Ground and Old State House is owned by the Super Mutants, Mongrels and Ghouls sit between Old State House and Old Corner Bookstore, a large band of Super Mutants (including one Suicider and one dude with a Missile Launcher) own Faneuil Hall, and there’s another small Super Mutant group between the Hall and Old North Church, your final destination. The real end of the Freedom Trail in Fallout 4. - Pop inside. The first room is safe, but the main section of the Church is inhabited by Feral Ghouls. Mercifully, not many of them are active - but there are a lot of suspicious bodies. Move slowly and use V.A.T.S. to identify which bodies need to be shot before you get too close. There aren’t many items to be found here, so don’t spend much time looking around. You’ll need a light source to navigate most of the time. - A door in the northeast corner of the main area leads downstairs, to a crypt. The path is straightforward, and there are more Ghouls waiting. Murder them as you go along. At the end of the path you’ll find another plate set into the wall. You can spin this plate clockwise and counterclockwise, as well as ‘press’ the central plate. By doing this you can enter a password from the letter clues you got along the Trail. Spell it out and you’ll have to enter RAILROAD. Do so - you need to press the central plate each time you spin to a number - and a door will open to your left. - Walk inside and you’ll be confronted by the members of the Railroad, an organization dedicated to saving Synths. Their leader, Desdemona, will pepper you with questions. 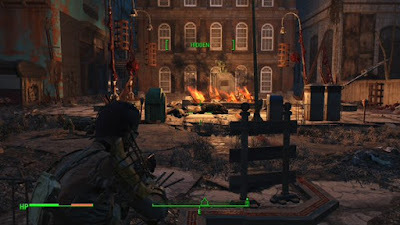 (If you’ve been helping the Minutemen a lot, expect a better reception.) Regardless of how you answer you’ll wind up with a new mission, Tradecraft, and new potential allies.